When it comes to skateboard trucks it’s easy to think they all simply do the same thing… right? You’d be right to think that, but you’d also be a bit wrong. Yes, they all work on the same principle and are basically built the same way. However, different trucks are better for certain types of skating and certain types of setups. They have small differences in their build that make them turn more, make them heavier or even make them stronger. Today I’ll be talking about the best skateboard trucks for street skating, and the difference between them. 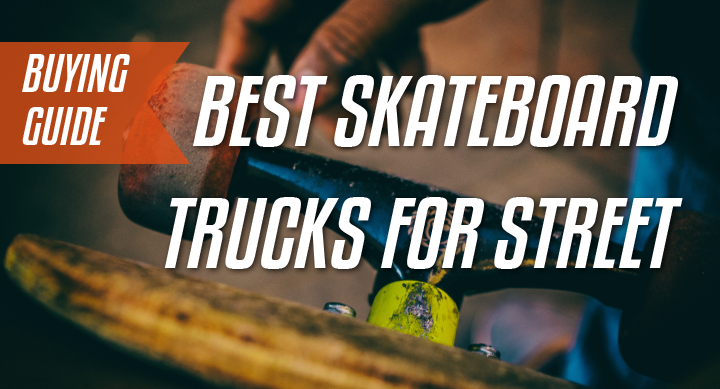 This article should help you figure out what you want from a skateboard truck. Easy differences to understand will be height and width. The taller your truck, the easier you’ll be able to do ollies, you will turn better and you’d be able to run taller wheels as it will be harder to get wheelbite. However, this will make it a bit more unstable, and landing tricks will be more of a challenge. The lower the truck, the more stable it will be. This will translate into it being easier to land and spin your board as you do flip tricks. It will also be easier to get wheelbite and you will have to run smaller wheels or use riser pads. It depends on your riding style and preference which one you pick. For beginners, mid-size trucks would be a good starting point, or even low ones as you can always use riser pads to increase truck height. Those who don’t want to worry about this, just get mid trucks and skate. So when we talk about the width, the rule of thumb is to have the width of your trucks around the same as the width of your board. This is the optimum position as you’ll get the best use out of your trucks. A narrower width will make your setup feel unbalanced and exaggerate any lean you input, and a wider one will make it harder to turn and do flip tricks. Slight differences are ok and can be ignored. *This width is measured by the length of the axle, not the hanger. And should typically be in Inches. Some trucks are made of different materials so are lighter by a few grams. Some trucks have different manufacturing processes so are stronger. Other trucks have hollow parts so they can reduce weight. These differences aren’t that important and don’t affect your skating too much. Once again they are simply personal preference and they usually make the product cost more. In my opinion, they are mostly gimmicks by the companies so they can charge more. There is also the matter of build quality. As with everything you get what you pay for, so cheap trucks will feel cheap and disgusting. 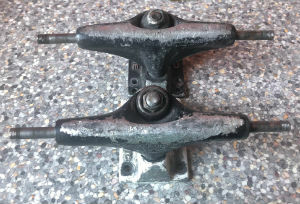 Honestly, if you are starting out, they might not be that bad, but once you get used to quality trucks you will be unable to enjoy skating with them. The big names in the industry are always a safe bet when picking trucks. Independent, for example, has been around for a while and have strong reliable trucks that last for years. Their trucks are known as one of the best for turning and grinding. However, some people consider them to be heavy. Venture trucks are considered super stable and slow to turn. This is because of them being ‘Low’ trucks. Skaters who have specialize on flat ground tricks love these. They make it easy to pop ollies and flip the board. They are also lighter than other trucks. Finally, we have Thunder trucks. They are described as sharp turning, light and strong. Even though they turn so sharply, they have a wider turning circle than the independents. People would swear loyalty to their trucks and would (probably) even go to war for them. People skate one truck for years and then try another brand for a while and literally refuse to ride anything else. This just serves to highlight how much finding the right truck is a matter of trial, error, and experience, and that the right truck really is right according to your personal preference. Do not go for any cheap trucks or buy a board from Walmart. They work very poorly and will give you a bad riding experience. It will be worth it to spend a few extra bucks and getting decent trucks from a quality brand. If you don’t know where to start, I suggest going for Independents. Their Lo trucks can be fitted with risers or skated that way so you get a stable truck that turns great and is super strong. Thank you for reading! If you’re interested in learning more about longboard trucks. Read our detailed buying guide.